The REAL Housewife of Snohomish County: STOP THE INSANITY!!!! Okay...it's day 15 and I'm ready for this to be done!! LOL. Most people are under the impression that any workout routine gets easier as time goes on. But it's my belief that if it's getting easier, you aren't doing enough and you need to push harder. So I'm here to tell you that Insanity is CRAZY! Oy!!! Last night we had two of our friends up for dinner...my first night of entertaining in the new house! 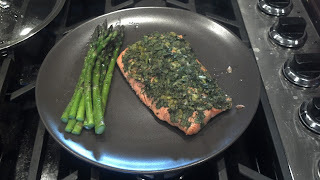 :) So for dinner I made Michael and our two guests Roasted Salmon and Herbs with Grilled Asparagus with Brown Rice. I on the other hand grilled myself a nice New York Strip Steak with Asparagus and Brown Rice! :) It was a winning meal! Everyone enjoyed the food and the conversation. They even brought their two dogs up and they spent the evening out in the yard with our two boys. Man there was rolling and barking and jumping...but everyone had a great time! :) There's nothing more satisfying for me than making a meal that my friends and family enjoy! :) I hope there are many more memories like that created in this home.